What is the least count? Vernier Calipers Least Count formula: How to calculate it? Least count of an instrument is the size generally mentioned in millimeter (Denoted by 'mm', notation used to indicate the measurement of length in metric form) indicating the smallest division on a scale. This value is nothing but the smallest size that can be measured using that instrument by the formula. By this value, one can decide how precise the instrument is. For example, the least count of Vernier Caliper is 0.02 mm and that of Micrometer is 0.01 mm. So, the micrometer is more precise here. Watch the video given at the end of this post. How to calculate Least count of Vernier Calipers by formula? How least count is calculated? 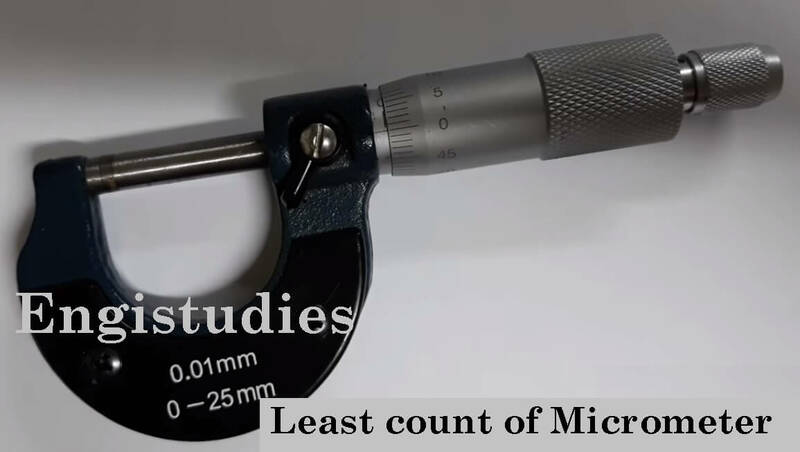 Least Count = Minimum size that can be measured with the main scale alone (MSD) / The total number of divisions on vernier or circular scale (VSD). What is the formula of least count in Vernier caliper? There are two scales viz. Vernier scale & main scale. The main scale is graduated in cm at the bottom and in inches at the top while the vernier scale just slides along these lines. 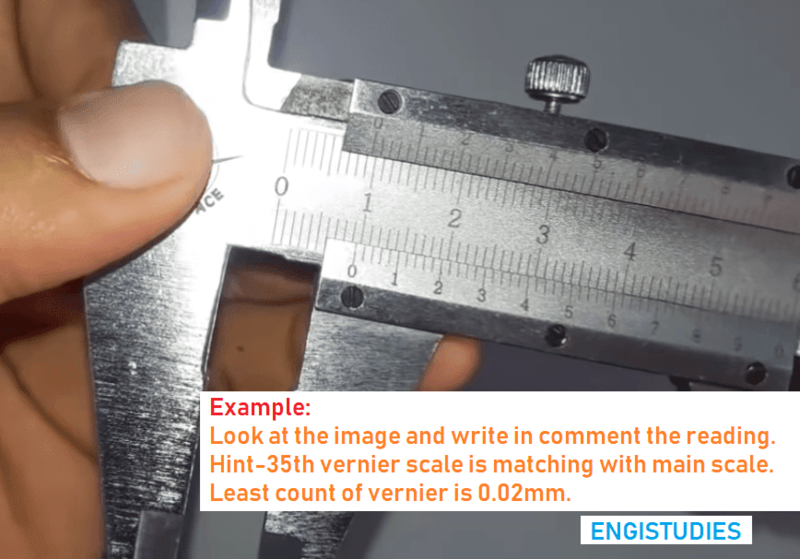 If minimum main scale division size is 1mm and there are 50 divisions of the vernier scale, least count value of Vernier Calliper is 1/50 = 0.02 mm. So, 0.02 is the least count of the vernier. There are two scales viz. circular and main. There are 50 divisions on the circular scale and minimum division on the main scale counts 0.5mm. We can calculate by the above formula least count of micrometer screw gauge = 0.5/50 = 0.01 mm. Thus, the least count is 0.025 inches. for a different number of divisions on the vernier scale the above value changes accordingly. Vernier is a simple instrument. It is used to read length, height, diameter, pitch, etc. of a workpiece. It is made up of the following main parts. Fix Jaw: The jaw attaches to the main scale at the leftmost end. It is also used as base support while measuring depth. Movable Jaw: The jaw is attached to vernier scale. It can slide and adjust to job length. Nibs: Using nibs we can measure any internal dimensions. Out of them, one will be fixed and other movable. Screw: Screws are used for locking the movable jaw. Strip: The strip at the tail of the instrument is used to read depth. Below are the functions of vernier which proves its importance. It can be used to find outside dimensions using fixed and movable jaws. It can also be used in the measurement of inside dimensions using nibs. It can measure depth. The strip is used for this type of measurement. If the zeroth division on the main scale does not match with the zeroth division on a vernier/circular scale, when movable jaw is in touch with the fixed one, then there is said to be zero error. Zero error may be positive or negative depending on the relative positions of scales. If the zero of the Vernier scale is to the left of the zero of the main scale then the error is negative and vice-versa. Slide movable jaw on the main scale and rest on both ends of the workpiece to take the measurement. Now, rotate the fine adjusting screw slowly for more accuracy. Use the screw to lock the movable jaw. Now read main scale reading, just before the zeroth division of the vernier scale. Add main scale & vernier scale reading. 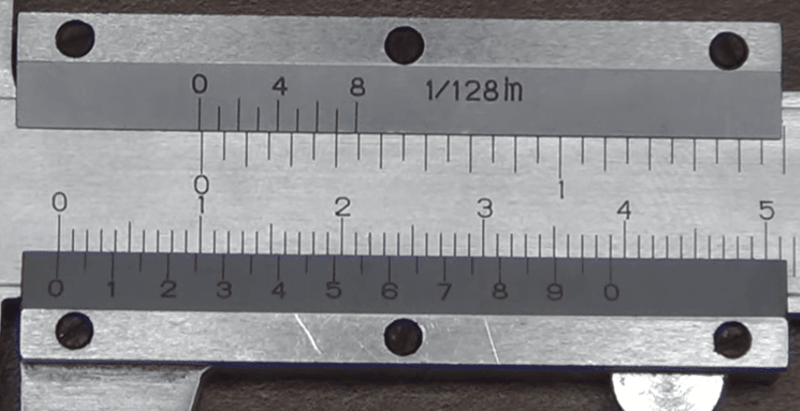 This is your final measured dimension on Vernier Caliper. The main use of least count formula is to measure things accurately. Comment below your ideas and do share this article with your friends. Answer for the example is 9.7mm. What Does CNC Stand For in Machining?